Gotham Skies... Available Once More! 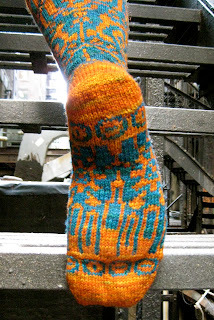 About two years ago I designed a pair of steampunk inspired socks for The Sanguine Gryphon. At the end of last year Sanguine Gryphon split into two separate companies and the sock pattern was no longer for sale anywhere. Well as of this week I am happy to announce that the pattern is once again available for purchase! You can find it on in my Ravelry pattern store, or you can purchase it through Cephalopod Yarns (soon) while you pick up some gorgeous Skinny Bugga to knit the socks with! 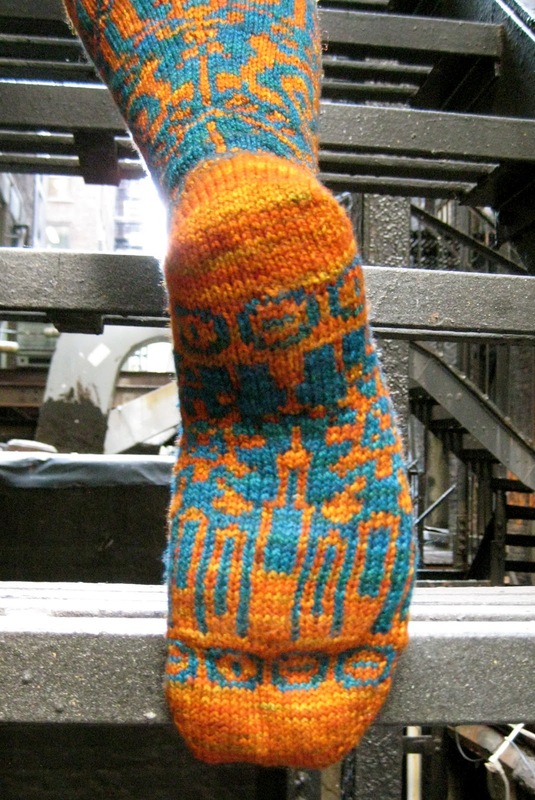 I am hoping to find the time to knit up one sock in a slightly heavier yarn and use it as a Christmas stocking. My apartment has this awesome mantel and it needs some stockings come December. I need to thank my pal Carly for letting me use her feet to take pictures. I like to ambush my friends at work and say "Pretty, pretty please can you model this so I can take pictures?" The day job is slow right now so I thought I would tackle a few things I keep putting off. 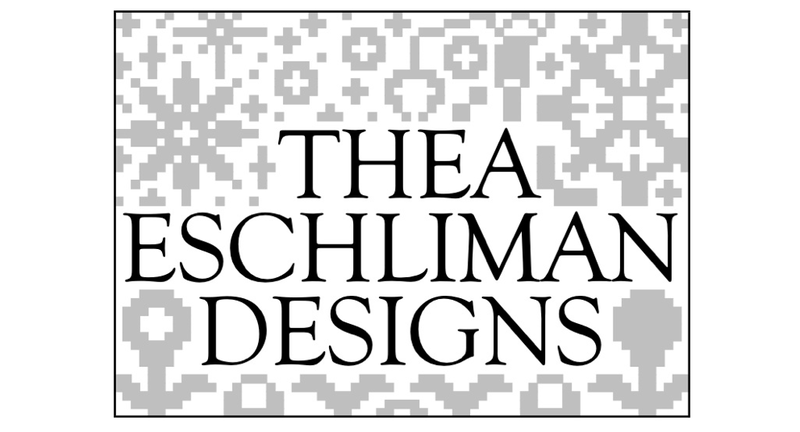 One of those things is starting a Ravelry group for Thea Eschliman Designs. If you are interested please join! I thought I would use it to announce new patterns, the occasional promotion, and as a place for people to post their finished projects. The picture was taken at Rockaway Beach in Queens NY. It was my favorite place last summer, wonderful on the day I took this picture, but has progressively gotten more crowded and the crowds are leaving the place trashed. Not cool. Trash = seagulls = seagulls pooping on people. NOT COOL. If caught on the right day at the right time though, you can knit a way in crisp ocean air, which is at least 10 degrees cooler than everywhere else, while watching surfers. 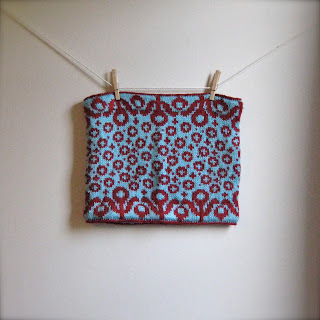 Hope to see you in the Thea Eschliman Designs Ravelry group! In January this year I was still riding that wave of energy from slamming out Christmas knitting, so I decided to whip up a bunch of matching cowls from some of my hat patterns. You have already seen the Pop Blossoms cowls, I have finally gotten around to photographing the Pollen and Bubbles cowl I also made. I wanted to mirror the flower pattern from the Pollen and Bubbles hat along the top of the cowl but the pattern did not quite match. Luckily all it took was adding one additional line to the colorwork charts to make the patterns match up perfectly. I have added that one additional line of colorwork to the Pollen and Bubbles hat pattern as well as adding some instructions for making the cowl. The instructions do not include any yardage requirements, because the charts can really be used with any weight of yarn, they can be repeated as many times as you want to make the circumference wider or the cowl longer. The cowl can also be finished with a full lining or without. Because there are so many variables, I did not include yardage. If you are curious what yarn I used for the example, the red is a Lion Brand Vanna's Choice Solid and the teal is Lion Brand Vanna's Choice Baby. They are both Aran weight. The charts were repeated 8 times around and Chart B was use twice to give it height. I did not fully line this one, it is just hemmed at the top and bottom. It is a whopping 34 inches in circumference and 13 inches high. I made it super big and chunky. I hope everyone reading this has been able to stay cool enough to knit this summer.